Have you ever felt stuck when interpreting a specific subject? Ever wanted to sit down with other professionals to discuss what tools they would use? Join us for this fun workshop and you’ll get your chance! Attendees will divide into groups that will dive into a group study. Brain storming, using websites, sharing tools, to figure out how to interpret specific subjects. Purchase your ticket now (you must be logged into your member account to see the reduced price). After payment is confirmed you will receive a link to register for the workshop. 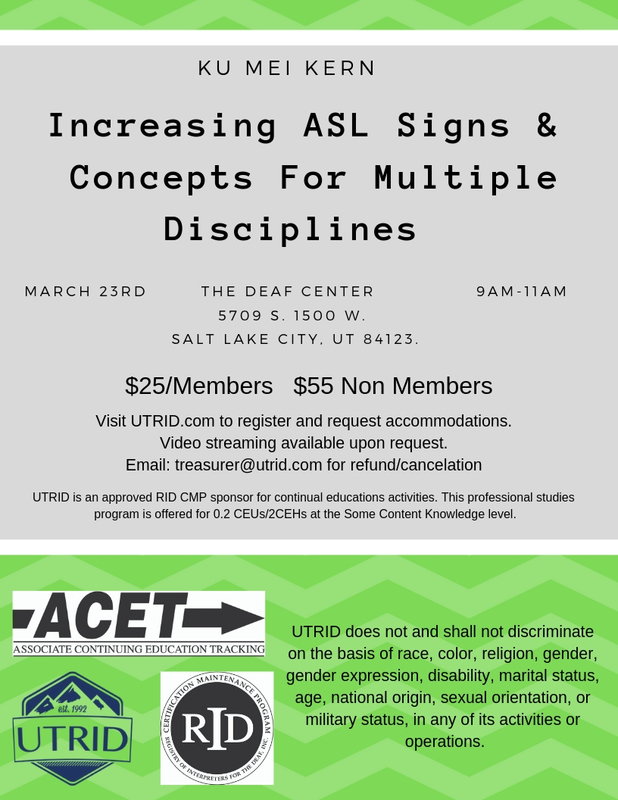 UTRID is an Approved RID CMP Sponsor for continuing education activities. This professional studies program is offered for .2 CEUs at the some Content Knowledge Level. UTRID does not and shall not discriminate on the basis of race, color, religion (creed), gender, gender expression, age, national origin (ancestry), disability, marital status, sexual orientation, or military status, in any of its activities or operations.